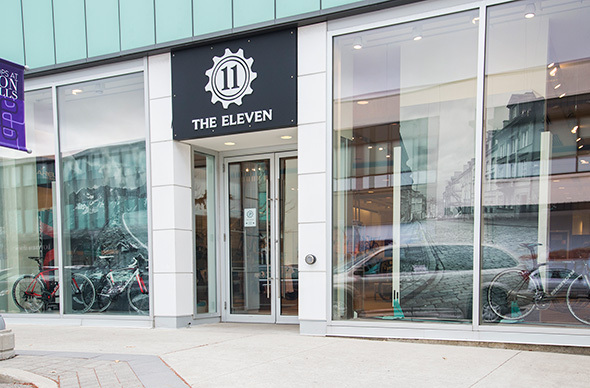 The 11 Inc. bike store at the Shops at Don Mills impressed me from the moment I walked through its doors. Much different than the typical Toronto shop, the 11 is incredibly spacious (6,000 square feet to be exact) allowing for each product and brand to be showcased appropriately. The store is a homage to adventures that have taken place on two wheels. 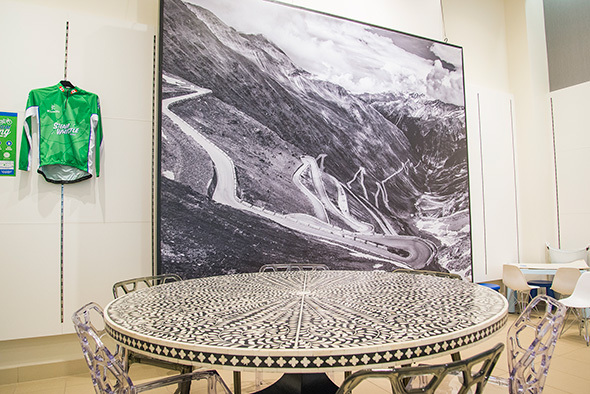 Large photos of famous bike trails and mountain ranges (that looks like the Stelvio to me) from around the world line the walls, with smaller hand-painted bicycle portraits mixed in amongst product. The in-store lounge is equipped with a big-screen television and oversized couches for customers to exchange stories, watch races and relax. Cyclists make the trip to hang out at The 11 and plan their next bike trip over a cappuccino or shot of espresso. 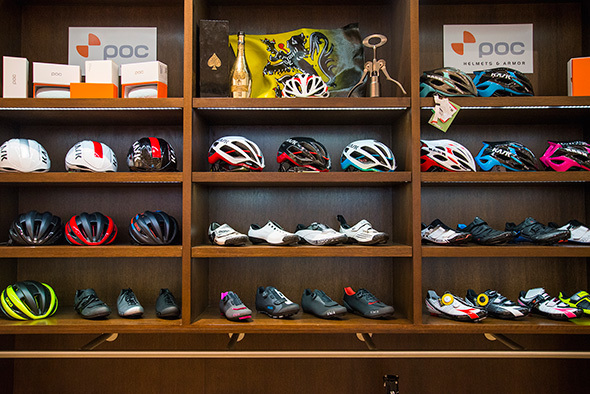 The store stocks a good selection of high end road bikes but is trying to make a name for itself for its professional bike fittings and knowledgeable service. 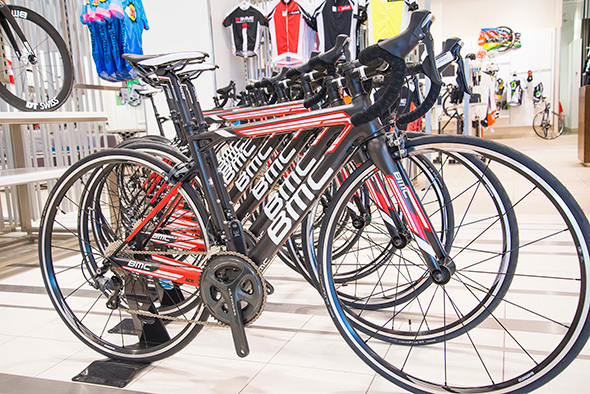 Road bikes at this shop start at $1,500 and go all the way up to $20,000. 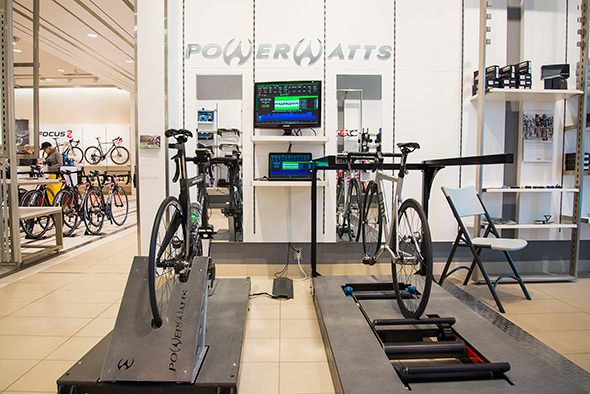 The price includes a special bike fitting using technology developed by the owner, Heath Cockburn, a former racer who has been working in the bicycle industry for over 22 years. 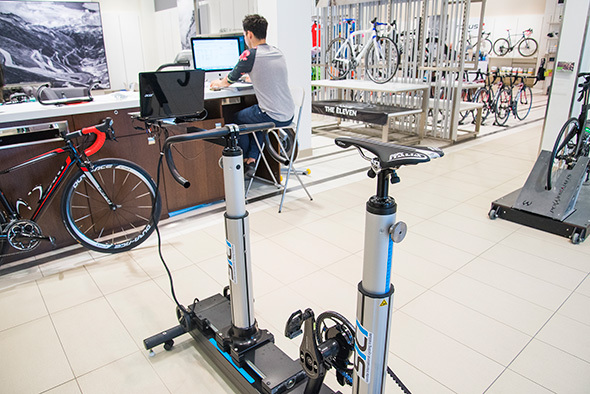 The in-store body scanner machine can scan the position and weight distribution of a rider to know exactly which bike part from over 46 different brands is the best match for your ride. 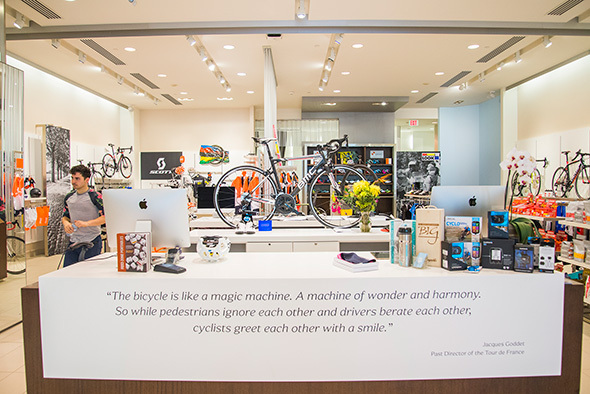 Cockburn's main goal with The 11 is to properly represent the bicycle manufacturers and so has organized the shop in a way that each brand essentially is its own store-within-a-store. 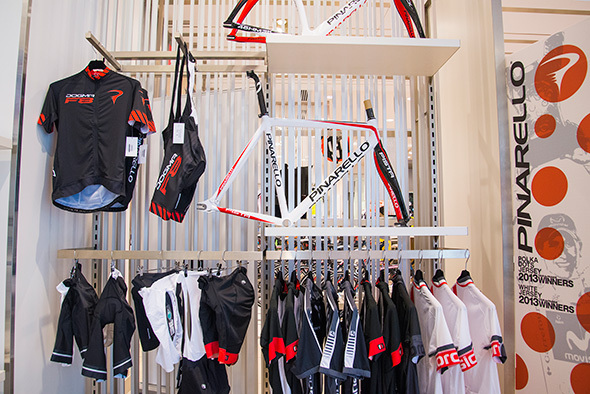 Major brands include Bianchi, De Rosa and Pinarello for bicycle parts and clothing, as well as Poc and Assos for eyewear and soft goods. 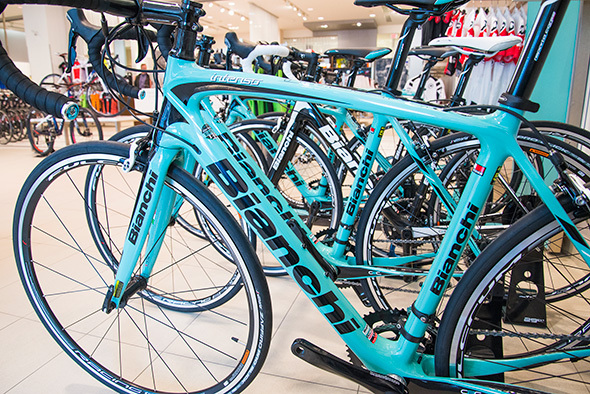 Within the coming months, The 11 will be the first shop in North America to carry the entire Bianchi product line. What you won't find here are accessories made for cruiser or hybrid bicycles. There are no basket or backpacks or fashionable rain vests - the 11 is dedicated to the road bike through and through, with a small selection of mountain bikes available for sale. On the clothing and accessories end of things, you can expect to find brands favoured by serious riders. 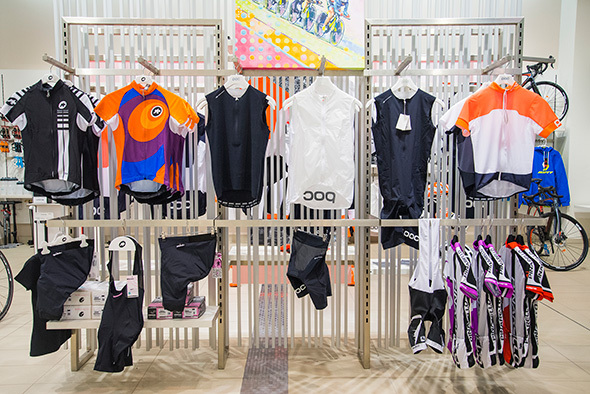 There's lots of Assos gear on hand, as well as helmets and apparel from POC sports, which you'll commonly see in the professional peloton. 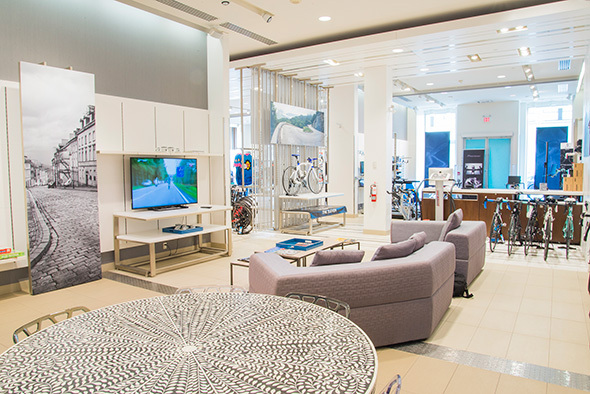 While Toronto has plenty of high end bike shops, I suspect that more than a few competitive riders who already have home shops will still make their way to the 11 to check the place out.